The focus on social media is to be seen. Right! Wrong. The focus of social media has lost its biggest thing. Being social. Social media is about connection with others. Yes many like myself use it as a platform for business. Well to be honest some overdue it and forget the social part and focus so much on the business which is hurting their business. How you might wonder. Think of it in aspect of yourself. If you have an account for personal or business what makes you stop and engage with others. If for business I’m not referring to the business places you make you go to for that. I’ talking about those you go to and for no other reason than being social. Ahhh…I see it’s dawning what I mean. Those you thought of is your being social for no other reason than enjoying it. Put that into any of your social media strategy. Stop making it an automated thing to do and have fun with it. This will gain you more interaction and well…you’ll enjoy it You’re more prone to do something you enjoy. 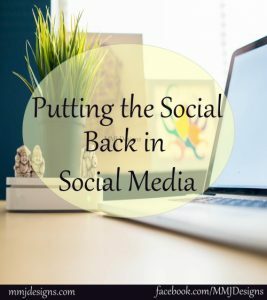 Putting the Social Back in Social Media. Want more insights like this join my newsletter below. There is more to come in a future blog post series I have. Join MMJ Designs Newsletter: http://bit.ly/mmjdesignsnews. Tips, info on services I have as well as insights into various things.